After a much futile attempt experimenting with the antique effect paint as mentioned in my last blog post, I used the traditional method of painting to achieve what I wanted with these 1:12 scale dollhouse miniature ladders. I started out making the small ones first, and after making four small ones, I felt confident enough to tackle a big one. I have some ideas to decorate the bigger ladder, which I'm excited. I still plan to make a few more when my fingers are rested a bit more, but it has been really fun. I experimented with the Martha Stewart antique effect paint recently. I usually don't use a cup for painting, but this antique effect medium calls for mixing the paint with it. Previously, I had a few unsuccessful experiments with this paint but I wanted to give this another try. After a few coats, I still don't see the effects. I am wondering is anyone seeing any successful results with this? All right, I'm going to revert to my own primitive way of achieving the antique effect for my miniatures. 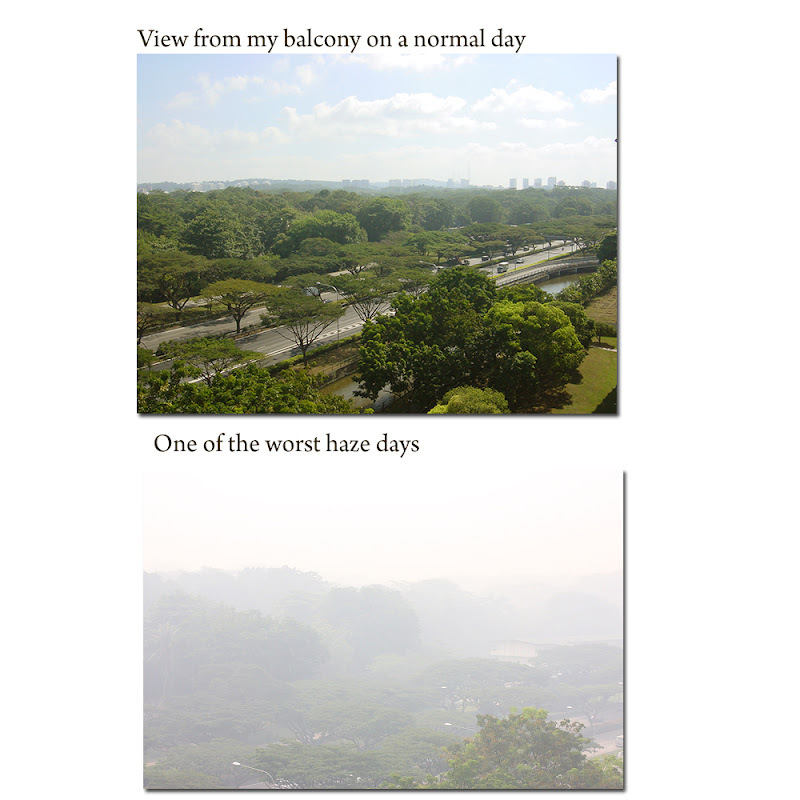 We are experiencing the worst haze ever in Singapore, due to the forest fires in Indonesia. In the past, it didn't really affect me that much. I don't feel uncomfortable in anyway except that everything looks hazy. But I know it's bad when I'm starting to feel the side effects the past few days, but more so today. My throat is feeling scratchy and dry, and my eyes are feeling a bit painful. Of course, you're constantly smelling smoke even when you're indoors. Interestingly, I found an old photograph in my computer. I took it when it was a bright normal day here. I have a beautiful unblocked view in my balcony, overlooking the forest, with lots of trees. It is a view I appreciate very much. I took a photo a while ago, just to show you how it compares to a normal day. As much as I would like to continue with my exercise routine, I don't think I can. :( The jogging path just below my block is deserted these days. I finally sat down to experiment making some tart liner papers in 1/12 dollhouse miniature scale recently. :) This was definitely one of my first tries. I tried making it from time to time a while ago. I also experimented with different types of paper, and I think I found something that worked for me. These ones that I made were used on this set of 1/12 dollhouse miniature fruit tarts. I quite like the effect. Although I do admit, the technique can be further improved on the tart liner papers :) There is a first time in everything. It's been a long time since I last made a dollhouse miniature macaron tower...and it felt really good re-visiting it. With renewed passion, I made this 1:12 scale macaron tower. One of the things on my list of to-do is this batch of faux macarons. I've always enjoyed working on these, and now it is almost ready to head for its new home in Boston! One of the most happiest things that can happen to a creator is when their creations get to beautify their new homes and make their new owners happy.